Spring is in Full Swing for Democrats! Spring is in Full Swing! with Town Meeting Warrants, campaign news, conventions, and fundraisers. Don't forget to share the news via Facebook and Twitter at http://CapeDemocrats.com. If you have news or corrections (like when the Straw Poll is), please send it using our feedback page. April 28 - Chatham - Bob Massie will be at the Chatham Community Center on Sat. from 3:30-5:00 p.m. This event is sponsored by Lower Cape Indivisible. 5 PM - 6:30 PM - Pot-luck dinner for Nauset HS students who attended "March for Our Lives." May 6th - Brewster Democrats invite you to join the Brewster in Bloom Parade on Sunday. If you live in Brewster, Chatham, Dennis, Harwich, Orleans, or Yarmouth, the YMCA wants to hear from you on May 8 from 5:30-6:30. Come hear from the Democrat of the Year and Community Service Awardees. Plus meet Boston Mayor Marty Walsh. April 30th Plymouth DTC - April Meeting at 7 pm Plymouth Center For the Arts, 11 North St.
May 6 - Wildcare Benefit - Experience the taste of South African BBQ on cape cod! A wild care benefit dinner - at Karoo in Eastham, MA. Wild Care Inc, the wildlife rescue, and rehabilitation center in Eastham, will host a mouth-watering South African Bar-B-Q at Karoo Restaurant in Eastham on Sunday, May 6. May 15th - Dennis - Selectman elections. This Saturday, Elizabeth Warren will be in Harwich to speak about the Opioid epidemic. The meeting will be held at Cape Cod Tech on Rt 124 off of Exit 10 in Harwich Center. We're looking for volunteers to come early and help collect signatures for Democratic candidates. On Saturday, April 21, Elizabeth Warren will host a community conversation in Harwich about the opioid crisis. She will take questions from the audience and discuss her plan to tackle the opioid crisis with a panel of experts. April 21st - Chatham DTC Meeting On the third Saturday of every month, the Chatham DTC meets at the Chatham Community Center, open to all. The meeting begins at 9:30 a.m. Jeff Dykens will speak on healthcare issues and to support on HR 1157 - "To clarify the United States interest in certain submerged lands in the area of the Monomoy National Wildlife Refuge, and for other purposes." The Candidates for Selectmen will have a forum at the next DTC. Please come to meet the candidates. Please join us today in remembering Sean Gannon, the YPD K9 officer who was killed serving a warrant. His funeral is on Wednesday. His partner, Nero, is healing at the veterinary hospital. Community Forum on HOW THE CHANGING CLIMATE AFFECTS US ON CAPE COD (Wednesday, 4/18, 7 pm-9 pm) at the Barnstable Senior Center at 825 Falmouth Rd.(Rte. 28) Hyannis, MA 02601. This event is sponsored by the Barnstable Democratic Town Committee and is free and open to the public in preparation for Earth Day. involving state government. Barnstable Senior Center, 825 Falmouth Road, Hyannis. For more information and questions please contact Jeff in Senator Cyr’s office: 617-722-1570. Monthly Bourne DTC April meeting will take place on Thursday, April 19th at 7 PM. Keystone Place has generously offered the use of their Pub space for our meeting, as repairs continue at the Community Building. Join the Cape Plastic Bottle Ban effort!...They are screening Divide in Concord across the Cape, to provide an example of what can be accomplished through civic engagement..."We, as a community, are the stewards of our own future, join us!" There are several opportunities to get active, to get informed, and to offer support for the offshore Wind projects - the Energy Facilities Siting Board is hosting a hearing on Vineyard Wind, April 24 at Barnstable High School at 7 PM. You can provide comment in person, or you can submit written testimony - information on submitting is on the EFSB and Vineyard Wind websites. Similarly, the Bureau of Ocean Energy Management is reviewing the project and holding open houses throughout the region. We were able to collect over 100,000 signatures in 9 weeks to put the 28th Amendment on the 2018 ballot last December. Now, the next phase of signature gathering for People Govern, Not Money's historic citizen-led campaign has begun, so it's time to get back in action to collect 20,000 signatures in 8 weeks. Come meet the people running high technology companies on Cape Cod. April 26th - Dennis Debate with candidates for Dennis Selectman. More details to come. On the fourth Friday of the month, share your voice with other women who are interested in civic engagement. 1- This weekend's St Patrick's day will have some political candidates marching and make-up meetings from the last storms. 3- March 15th - CIDC General Membership Meeting - Join the CIDC next week to meet the members, review the strategic plan, and get ready for the coming Blue Wave. The CIDC & YDTC are encouraging people to walk with Senator Julian Cyr and Congressman Bill Keating in the Parade. We will be meeting at 10 am on Saturday at the Parade in Yarmouth, in slot B11. There is parking at the nearby Stop and Shop. If interested, we would appreciate it if you could RSVP at the link below. School Superintendent Scott Carpenter will speak to our committee on Saturday. We are also inviting the High School Democrats. Join them this Saturday, March 10th at 10:00 a.m. at the Harwich Community Center. R.S.V.P. at settiwarren.com/houseparty - Please feel free to share. All are welcome to attend. Wayside Inn, Main St, Chatham. Fundraiser for local scholarships and the Chatham Rotary Good Works Fund. The CIDC Fellowship Program officially launches on Sunday, March 4th with introductory training on the Cape, where Fellows will be briefed on the state of the Cape races and trained in the skills they need to make an impact. Fellows will then be assigned specific regions and goals to tackle. All participants must fill out this form by Monday, February 26th! Chatham Caucus - Please note time change: from 9:30 a.m. to 9:00 a.m.
We will be electing 2 female delegates, 2 male delegates and 2 alternates (one male, one female) for the convention. When possible, Chatham delegates carpool to the convention also to reduce costs. This year's Convention will take place at the DCU Center, Worcester on Fri. June 1, & Sat. June 2. Tickets are now available for the 2018 Kamarck Award Luncheonon Saturday, March 25th. The Brewster Dems will be honoring Representative Sarah Peake for her dedication to promoting policies and legislation that make our community stronger. There will also be a special posthumous award to Mary Lou Pettit. Hors-d'oeuvres buffet luncheon, and Cash Bar are available. 49 Thousand Oaks Drive, Brewster, MA 02631 For further info, contact Katie Jacobus. A distinguished panel of speakers will present current information on climate impacts and answer questions from audience members. 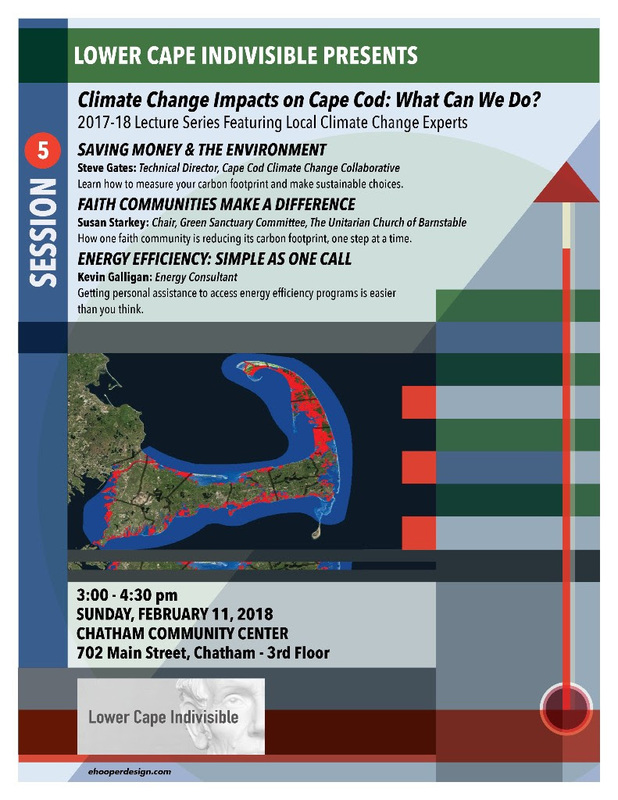 In addition, representatives from local environmental organizations will offer ideas on how community members can be engaged in important efforts on local climate issues. The panel will be moderated by Britt Beedenbender, Town Councilor, Precinct 4, Barnstable. Sat, Feb 24 - 4pm - 6pm - Come support Julian Cyr's re-election! Enjoy libations & light refreshments. ALL ARE WELCOME! This morning, in a bold editorial, in the Boston Herald, Maura declared that this is "not a reality we can accept"
Right now Maura is asking you to share her message on Facebook. Tweet out your support with these messages or some of your own. Proud to live in a state and support an AG that won’t be backed down by the gun lobby. Thank you @maura_healey for speaking out for the majority of Americans who support common-sense gun reforms #EndGunViolence “It's heartbreaking to think about the worry they have to endure as they send their kids off to school..."
http://harwichdemocrats.com & http://harwichdemocrats.org - The Special Guest is Julian Cyr, and we will honor the Mabel Canto and James Noonan awardees. Bill Keating's campaign - Nomination signature collection - Bill Keating's campaign is gathering signatures to qualify for the ballot this November and YOUR help is needed because he must collect more than 3,000 handwritten signatures over the next few weeks. Whether it will be only you signing or if you can gather 15, 25, or more signatures, everyone bit helps. Or, you can contact the campaign. On behalf of Congressman Keating, thank you! The Cape Women's Coalition invites you to join in their fifth-anniversary celebration of women and our resilience. Don't forget to get your flu shot and donate blood! The Caucuses are coming up. It's a great way to meet others in the Party and learn how the Convention and caucus process works. Please check with your town committee on the details. The caucus to elect delegates to the 2018 Democratic State Convention will take place on Saturday at the Yarmouth Police Dept meeting room, 340 Higgins Crowell Rd, So Yarmouth. We will be electing 13 delegates ( 6 female, 6 male and 1 either) and 4 alternate delegates (2 female and 2 male). Registered Democrats in the town of Yarmouth are eligible to run. http://harwichdemocrats.org - The Special Guest is Julian Cyr and we will honor the Mabel Canto and James Noonan awardees. My name is Lily Welch and I'm the field organizer for the Cape and Islands for Elizabeth Warren's reelection campaign. 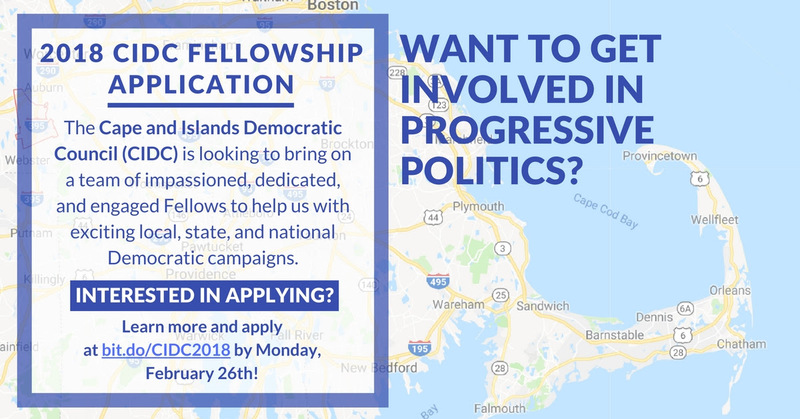 I'll be working with the Cape and Islands to help reelect Elizabeth and keep her fighting for us in Washington. Caucuses are fast approaching and we are looking for eager volunteers to help collect signatures for Elizabeth's nomination. We hope to be at every Cape caucus to make statements of support and collect signatures, but we need your help. If you will be attending your caucus and are interested in volunteering for us, please contact me at elizabethwarren.com. Cape Cod PATH was recently recognized for their work against human trafficking. An evening of “resistance fun and games” at 5 p.m. Sunday at The Church of St. Mary of the Harbor, 517 Commercial St. in Provincetown. At this year’s Democratic Convention, delegates will nominate a candidate for Senator, Governor, Attorney General and other contested offices. Most importantly, it will be a time for us to gather and get charged up for the November elections. If you’re already planning to attend your caucus and want to be a part of our campaign team, click here to volunteer to be a Healey Caucus Organizer. You would distribute brochures and bumper stickers, as well as collect names for our email list. Last year, local Democrats reported unprecedented numbers of new people getting involved. Let’s work together to make sure we continue this wave by brining new people into the party.